Several weeks ago, Deacon Charlie Germain made a presentation to the Patterson Rotary about the need to raise $30,000 to keep the Brewster Emergency Shelter open for the coming winter. The Brewster Emergency Shelter Partnership (BESP) was formed by the congregations of the Brewster community to provide a safe sleeping environment during the coldest winter months for those that are in need. The congregations provide temporary sleeping sites for a week, evening meals, overnight hosts and other services. The sites include cots, bedding, sanitary supplies and winter clothing when available. A paid overnight supervisor is in charge and spends the night with the guests to provide a comfortable and safe environment. "Keeping the doors open this winter has been our primary focus," deacon Germain told the Rotary. "We need to raise money from interested parties who want to help us and help people in need." The BESP is modest and gets by on minimal costs by relying on volunteers when possible and donations. 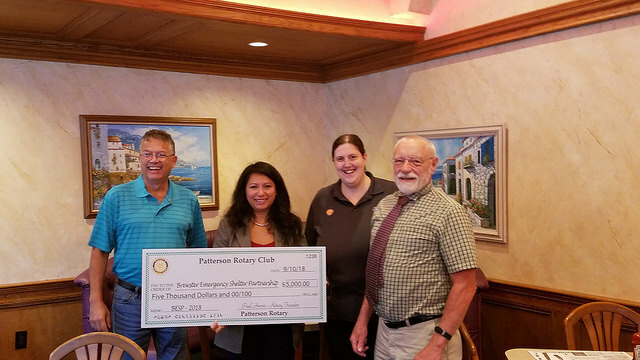 "It is difficult to find a group with more purpose and need then BESP," responded Carrie Hernandez, who is the current Patterson Rotary president. The Rotary board responded quickly to their request with a donation of $5,000. "We knew we had to get them something quick so they could make plans to keep their doors open," she continued. Norma Pereira, a BESP board member was on hand to receive the check and expressed her sincere appreciation for the donation. The donation, coming days before their Blues and BBQ fundraiser, made the members proud. Rotary member Dan Horkan said it best - "I think we can all agree, that causes such as BESP are exactly why we work so hard to raise the money."